Within the city, take the CTA Blue line train to the UIC-Halsted stop. From the suburbs, take a Metra train to downtown Chicago. Take I-90/94 (here, the Kennedy Expressway). Exit at Roosevelt Road. Turn right (west) onto Roosevelt Road. Turn left (south) onto Halsted Street. Continue south on Halsted Street to the intersection with Maxwell Street. Take I-90/94 (here, the Dan Ryan Expressway). Exit at Roosevelt Road. Turn left (west) onto Roosevelt Road. Turn left (south) onto Halsted Street. Continue south on Halsted Street to the intersection with Maxwell Street. Take I-290 (the Eisenhower Expressway) to I-90/94 South toward Indiana. Exit at Roosevelt Road. Turn right (west) onto Roosevelt Road. Turn left (south) onto Halsted Street. Continue south on Halsted Street to the intersection with Maxwell Street. Take Roosevelt Road west to Halsted Street. Turn left (south) onto Halsted Street. Continue south on Halsted Street to the intersection with Maxwell Street. Metered street parking is available on Halsted Street near our office. The parking boxes located on each side of the street accept quarters, dollar coins, and credit cards. The receipt is placed in the car window visible from the sidewalk side. Free parking can be found a few blocks from our office. Map of free parking locations. Visitors can also park in the Maxwell Street parking structure, near our office: $2 for the first 2.5 hours, $5.75 for more than 2.5 hours after 3:00 p.m. 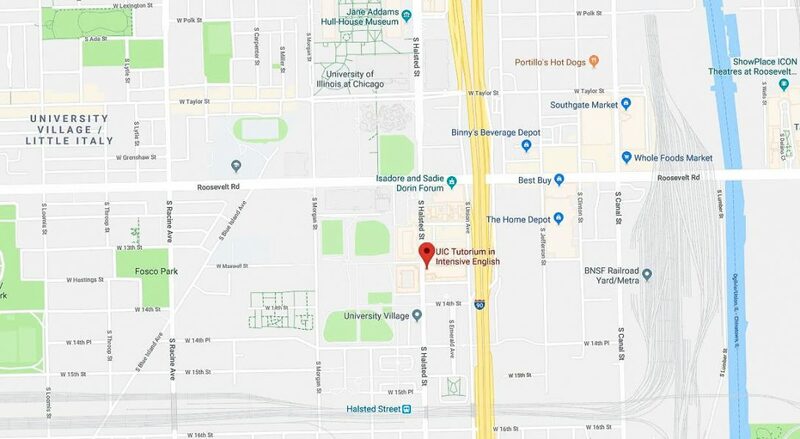 This UIC parking lot is east of Halsted Street with entrances on Maxwell Street and Union Street. For east campus and the classroom buildings, visitors park in other UIC parking lots. Rates vary.